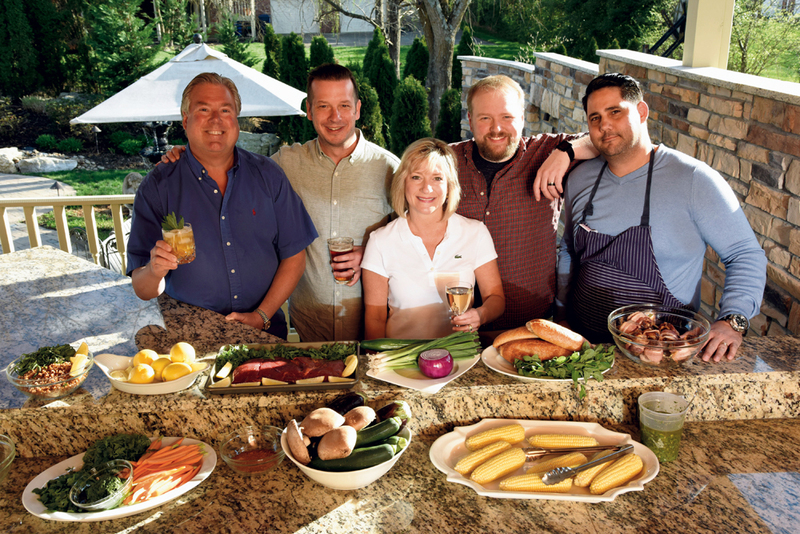 We love the grilling season, which we extend beyond the summer into a year-round cooking experience. But for most, summer is the time to break out the grill. No matter whether you are a traditional charcoal griller or a fan of the quick-starting gas grill, a balmy summer evening is the best time to be outside enjoying a cocktail and savoring the aroma as the food begins to cook. Often, though, grillers can fall into a rut, putting the same things onto the fire, like burgers, hot dogs or the occasional steak — not that there’s anything wrong with that. 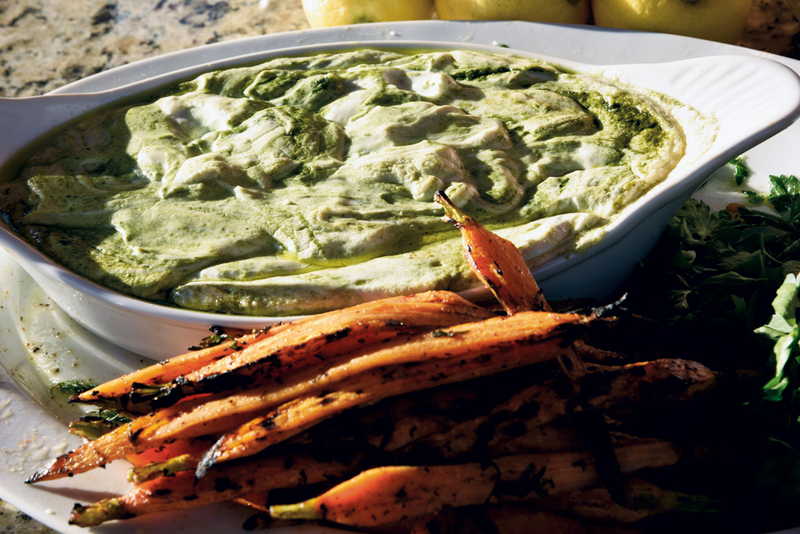 But there are a lot of other dishes to grill that lend themselves to easy summer entertaining. We invited three of Louisville’s top chefs over to show the versatility of fare beyond the same old, same old. 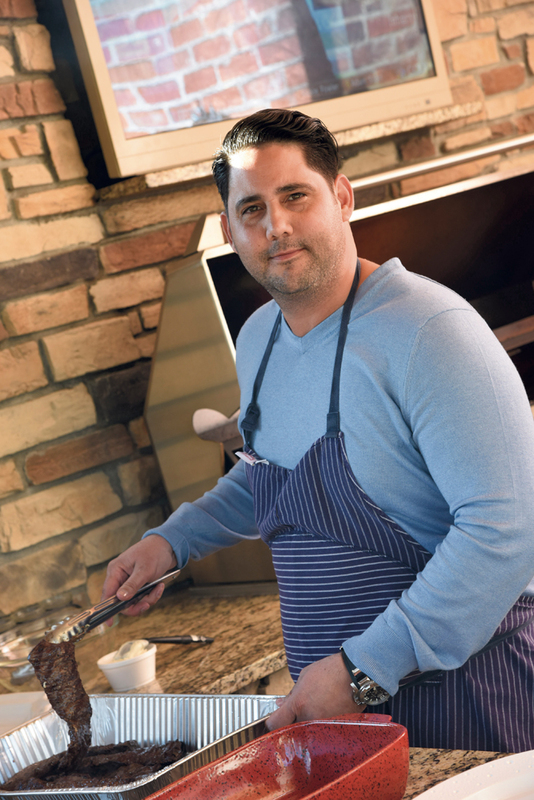 Chef Fernando Martinez, the driving force behind the hot Olé Restaurant Group (Mussels & Burger Bar, Artesano Tapas, Mercato Italiano, El Taco Luchador and soon-to-open Red Barn Kitchen), still finds time to grill up some Latin-inspired favorites for his friends. 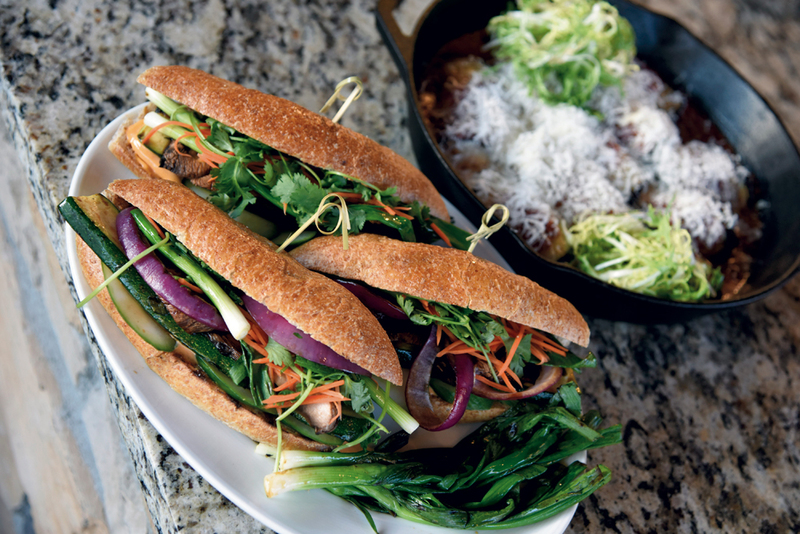 His ideas for boosting flavors are simple and effective. 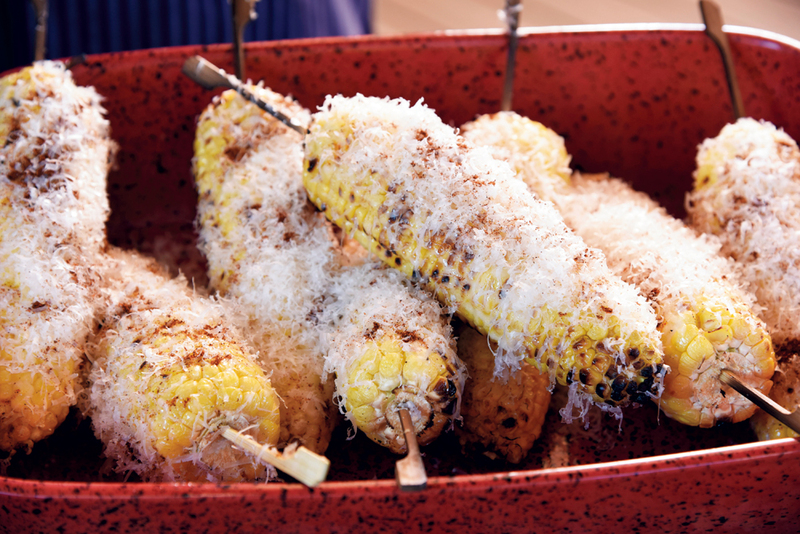 Grill some ears of corn, brush them with mayo and sprinkle with cheese, and you elevate ordinary corn on the cob to something familiar enough for kids to enjoy, and sophisticated enough for adults to savor. Dates are rich in themselves. 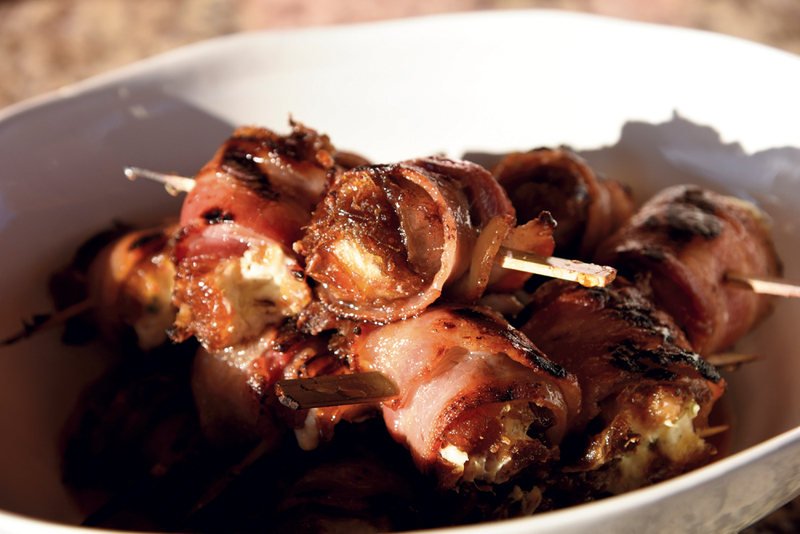 Stuff with goat cheese, wrap in bacon and grill, and you have an appetizer to remember. 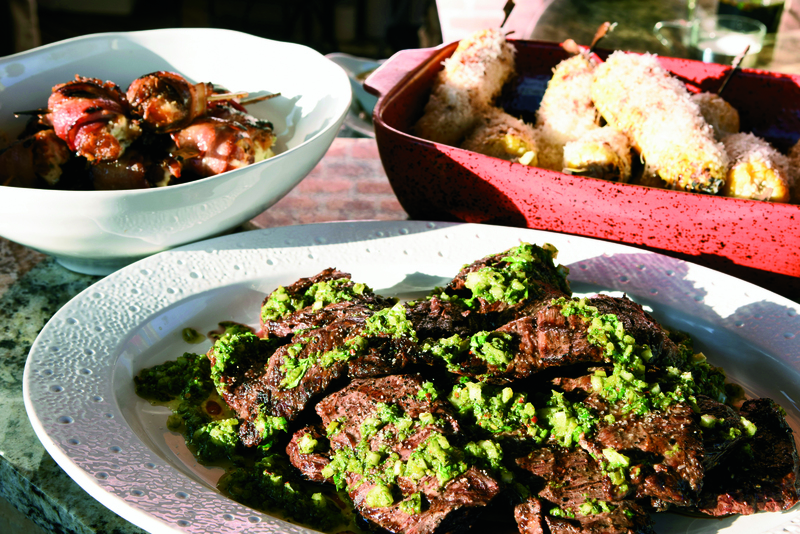 Skirt steak grills rare in a flash; a chimichurri sauce adds a lot of bright flavor from very little effort. 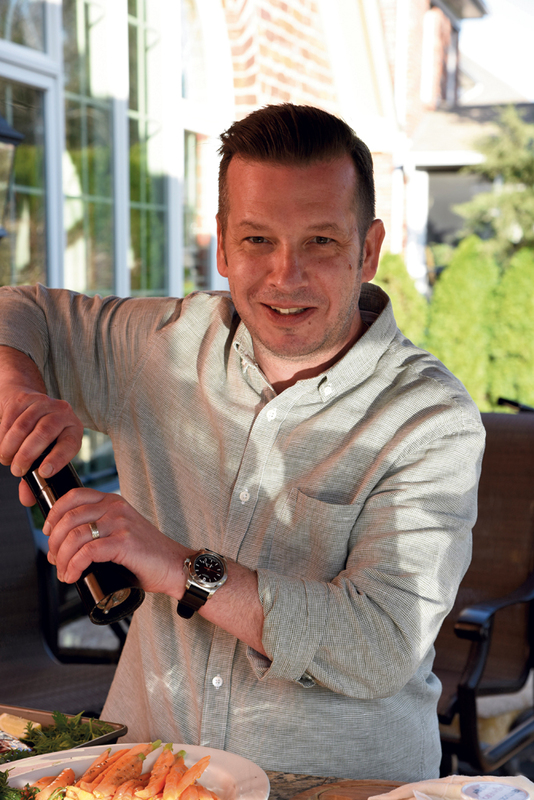 Patrick Roney, executive chef at Harvest, was inspired by the flavors he found when he was a private chef on a yacht, sailing from southern Turkey to Italy. “One night,” he said, “our boss took the crew to dinner where they had just slaughtered a lamb that was spiced with this amazing rub that you could smell from miles around.” His Bharat spice mixture requires a lot of ingredients, and some unusual ones, but it results in a shelf-stable mix that works wonders on butterflied leg of lamb — and on almost any other grilled or roasted meat and vegetables, too. His wheat berry salad is a hearty side dish that is easy to put together and not commonly seen on picnic tables. Dallas McGarity, chef at Marketplace at Theater Square, is noted for the meat dishes on his menu, but at home, he has a vegetarian wife and kids. “I cook vegetarian for them all the time,” McGarity said. 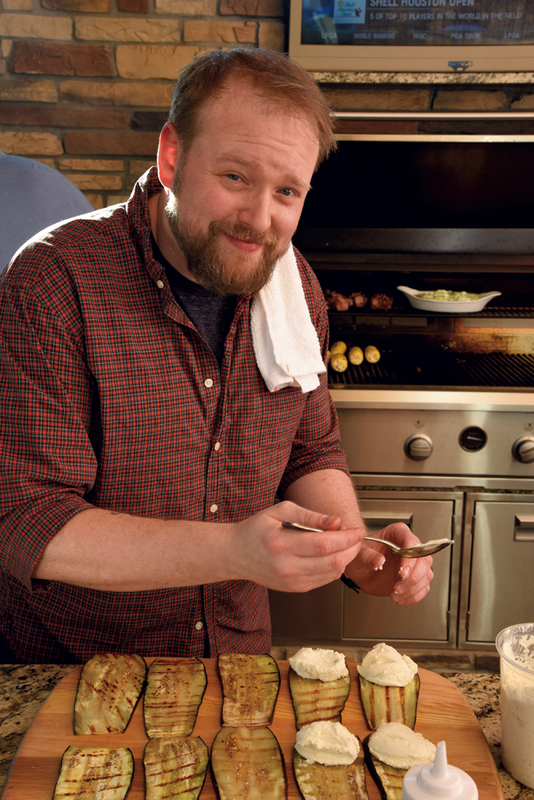 “My cooking for them was the inspiration for my two grilled vegetable dishes.” Grilling the eggplant for the involtini softens the vegetable so it can be easily rolled around the cheese filling, and grilling over charcoal imparts a smoky richness to the sauce. And grilling several different fresh seasonal vegetables adds a savory sweetness to a meatless Vietnamese-style sandwich that will make vegetarians kids and friends look with pity on their fellow carnivores. 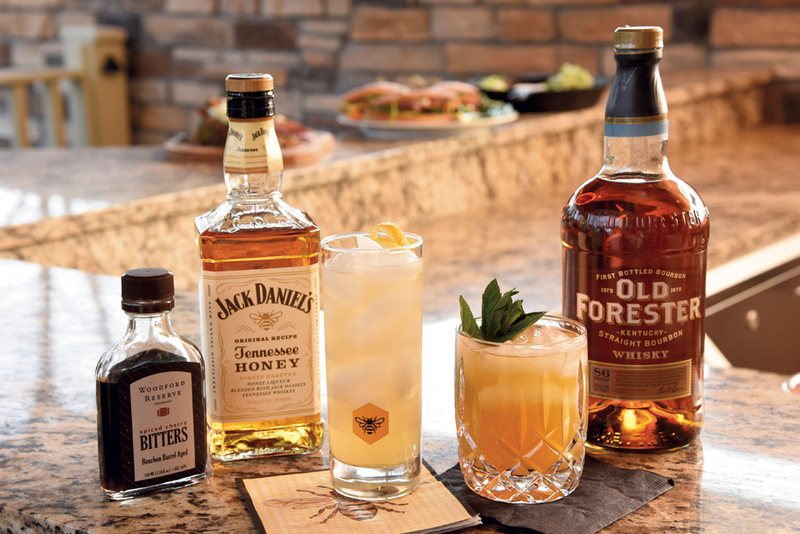 And, of course, cooking out on the patio or deck talking with friends is a perfect excuse to pour a fun cocktail or two to enjoy outdoors during the grilling process. As usual, we have a few ideas for cocktails to enjoy while tending that grill. temperature. Drizzle the chimichurri sauce over the meat. Place the goat cheese in a bowl, soften with a fork, and season with salt and pepper. Open each date and stuff with about a tablespoon of goat cheese, then wrap in bacon, securing with a skewer. Grill until the cheese is melting and the bacon is crispy. Place skewers firmly in each ear to make it easy to turn the corn on the grill. Grill the corn evenly on all sides until it’s nicely grilled and charred in spots. Remove from heat. Using a brush, cover the corn with the mayo, and sprinkle the cheese, chili powder and cilantro over all sides of corn. Brush olive oil on eggplant slices and season with salt and pepper. Grill until tender, 5 minutes or less each side. Char marks are good. Remove and allow to slightly cool. Mix the ricotta, garlic and Parmesan and season with salt and pepper. 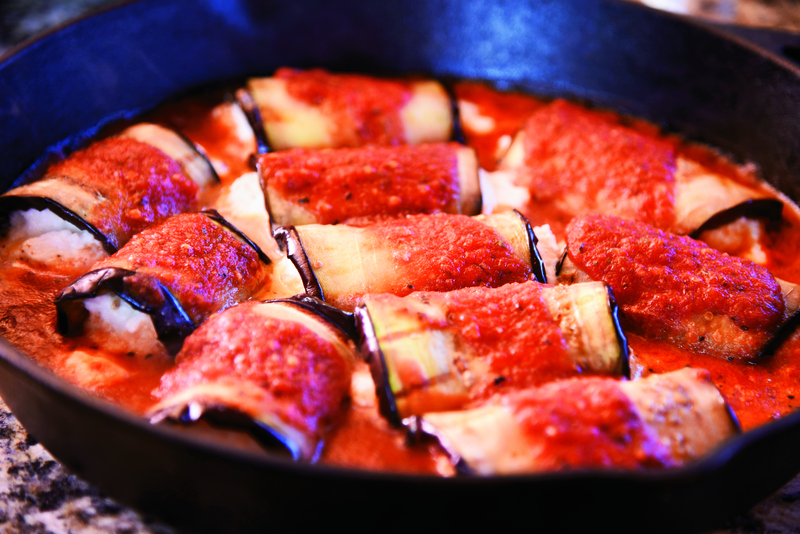 Place a dollop of ricotta mix on one end of each eggplant slice and roll into little logs. In a cast-iron pan, put a nice layer of tomato sauce on the bottom. Add in the involtini and put more tomato sauce over the top. Place the pan on the grill for about 12 minutes to heat everything through. When it is bubbling and hot, remove from the heat, grate some fresh Parmesan over the top, and garnish with parsley, friseé, or basil. and pepper. Grill the onion, zucchini and mushrooms and set aside. the top half of the bread and serve warm or at room temperature. Pat the leg of lamb completely dry with paper towels. Then rub with olive oil to coat. Drizzle honey over lamb and massage into flesh, and season lamb with sea salt. Generously sprinkle Baharat seasoning all over lamb and massage again. Place lamb on a very hot section of the grill. Cook 2 minutes and rotate the meat 45 degrees. Grill for 2 more minutes and flip meat over. Repeat the rotations as on the first side. continue cooking off of direct heat. Let lamb rest for 15 minutes. 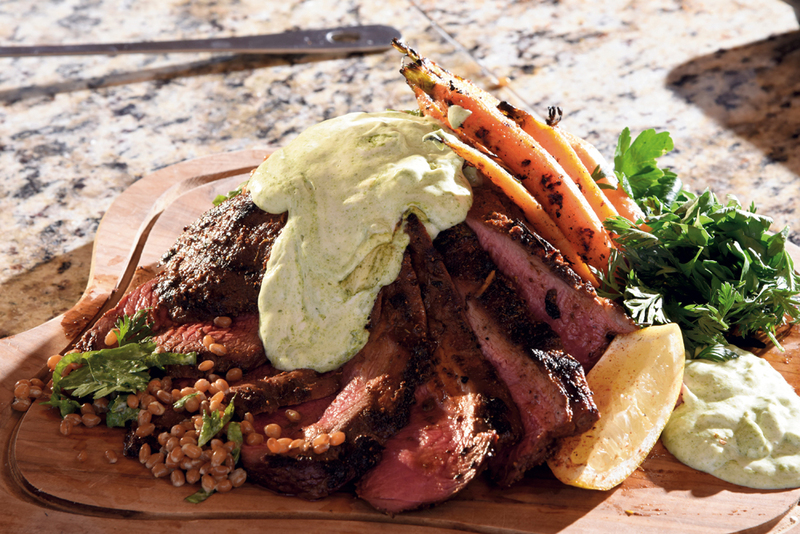 Slice lamb against the grain and serve with goat cheese fondue, wheat berry salad and grilled carrots. in a clean jar with a screw top. Note: Sumac can be found in most Middle Eastern ethnic markets in town. The dill and fennel pollen are more unusual spices; Chef Roney recommends getting those through the Terra Spice Company (www.terraspice.com) or Amazon.com. to a fine powder. Set aside. Have all dairy ingredients at room temperature. Blend together the goat cheese, cream cheese and créme fraîche in a food processor or KitchenAid with paddle attachment until smooth. Blanch carrot tops in salted boiling water for 30 seconds and refresh them in ice water. Drain, then puree carrot tops and ½ cup olive oil in a blender until smooth. Fold carrot top oil into the cheese mixture and season with salt and pepper. Warm fondue on the grill as well. A cast-iron pan or a small casserole dish works well. Rub carrots with equal parts honey, Baharat seasoning, salt and olive oil. During the rest time for the lamb, cook the carrots directly on the hottest part of the grill until desired tenderness. Cook wheat berries in boiling salted water until al dente tender, just as you would pasta. This will take 45 minutes to 1 hour. Drain well. Toss together wheat berries with all other ingredients just before serving. Stir and garnish with lemon wedge or twist. Shake and strain into rocks glass with crushed ice. Garnish with mint sprig and optional peach slice.